On Friday night, my brother- in- law heard someone talking to him in his dream, however could not understand who it is. The next day again he remained irritated and shouted on my parents- in- law. On Saturday night, he had a vision of Sai Baba and Maa Durga talking to him and calming him down. Baba lovingly moving His hand on his head and saying that he has to be calm and wait for things to happen. He has to respect his parents and his siblings instead of shouting on them. Be happy. The next day onwards we found the change in our brother-in -law, the person who kept nagging and shouting for silly things, had started smiling. Baba has really shown him His love and that his family is with him. My brother-in -law has become a better person. 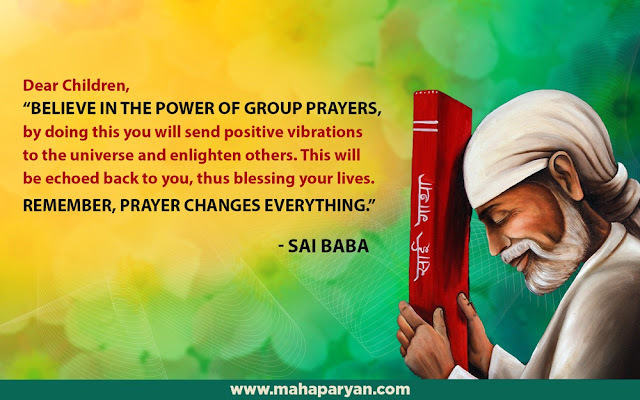 Sai Baba Ki Jai, koti koti pranamams to Sai Baba. Thank You Sai maa for everything. When Sai gives it is permanent and can never be withdrawn back, only Baba can change the destined for good and hence we should rest our case in His court (darbar) for He will never be unfair. Love You Sai. Jai Jai Ho Sai.